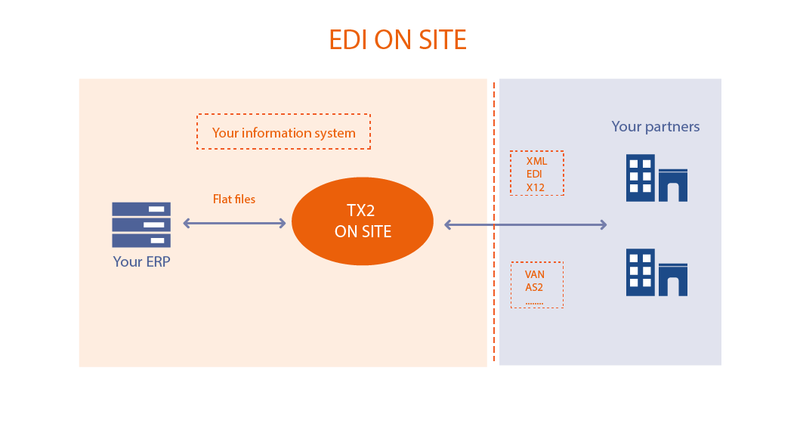 If you would rather have your EDI processes integrated on site, our TX2 EDI On Site solution is the answer. Developed and maintained by TX2 Concept, TX2 EDI On Site is a set of modular solutions (translator, communications software, etc.) for exchanging e-documents directly between your applications (ERP) and your various partners. Multi-sector: GENCOD, EDIFACT, EANCOM, GALIA, ODETTE, VDA, ANSI X12, INOVERT, etc. Multi-message: DELFOR, INVOIC, ORDERS, DELINS, KANBAN, etc. Multi-network: ALLEGRO, ATLAS, GEIS, OFTP, IBM/IE, etc. Multi-protocol: OFTP, X400, ASYNCHRONE, AS2 EDIINT, etc. TX2 EDI On Site runs on all Windows platforms, including virtual environments, Unix environments and MVS. Translation, communication and automation engine to keep our solutions running on a day-to-day basis. Module used to record partners and their EDI message profiles, allocate a communications network and program the PLC. This module handles the operating settings, freeing the user from any of the technical considerations of EDI. Our solutions are capable of fully automatic operation. Tasks are then triggered either as programmed (date and time), by frequency or by event.